After learning from Nick's flexible wheels that printing rubbery materials is totally possible, I came up with a tentative idea for shock mounting armor (or whatever ppl decide to shock mount) that might replace the current rubber mounts commonly seen on heavyweights. The reasoning behind this is to make sure that the screw never directly touches the two plates it is trying to join, so that there will not be a direct impact transfer through the connection. So far it is pretty similar to the normal rubber mounts. This system differs from the traditional rubber mounts when it is subjected to tension. From what I hear rubber mounts do poorly when an external force tries to pull them apart axially. 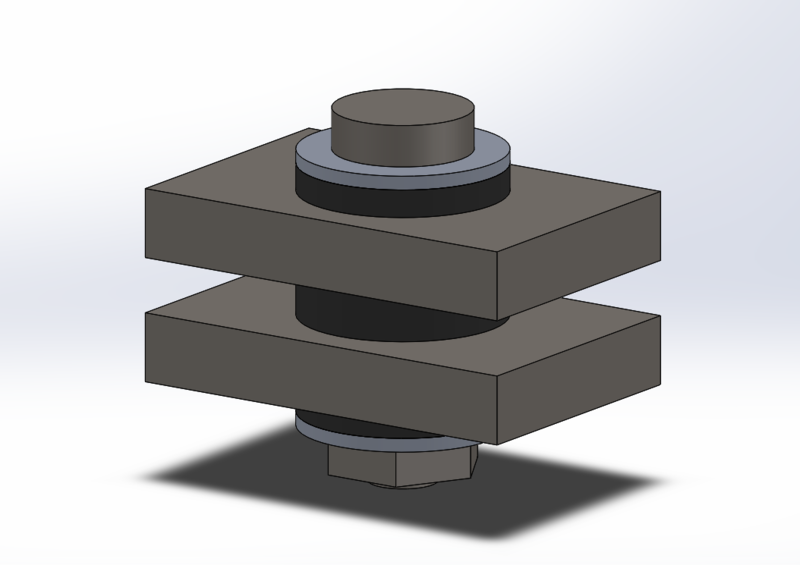 In this system axial tension loads are ultimately taken by the screw in the middle, which I think is stronger than the rubber in the rubber mounts. I would love to hear what you guys think of this idea. It's a lot easier to buy commercial dampeners. Those work about the same, but use a flanged nut or bolt embedded in a piece of rubber. Unless you need especialy flat ones, it's not really worth the time and material spend on it. Yeah the money spent in the printer and stuff like that will be much higher than buying off the shelf parts. However according to some builders at KOB and CBS, they tend to fail in that the connection between rubber and the threaded inserts is not sufficient (in some cases they even broke under shear, not to mention under tension). One of the ways to get around this is to use one or multiple shafts to connect the armor and the frame, and add a rubber sleeve between the frame and the shaft. But that costs a lot of weight. If a commercial dampener fails in a few minutes (a fight or even 5 fights), its because it's been incredibly overloaded. Better to use more small ones than a few big ones, and be sure about load factors. Yeah the poor dampers were probably very overloaded. I wonder what's the reasoning behind more smaller ones being better than a few big ones? Load distribution. Then the dampeners won't be pulled off kilter when the shocks come in. Did you mean having more small dampers so that they can cover a larger area and be harder to tilt? That is a way to write it. How do you remove gaffatape? Starting in 1 corner and work to the full width. By using more ,dampeners there isn't an "easy start" corner. Same for covers on pressure vessels. Even if 1 big bolt would do the job, more , smaller ones are used to spread out the load. Ah I see now. Thx.